Halloween has passed and Thanksgiving is upon us, which means I am currently listening to my all-time favorite Christmas bops. Don’t fight me on this—Thanksgiving is cute and all, but I’m really just waiting for Santa to come down my chimney. Let me deck my halls and ring my silver bells while I eat the Figgie pudding so graciously brought to me by those random carolers at my door. With the Christmas season almost upon us, I figured it would be a great time to revisit my Amazon wish list and see what I might want to ask for. As I scrolled through the list, I really couldn’t help but laugh at myself. While most of it was practical and reasonable, there were some strange oddities on the list that had me questioning my state of mind when I first saw them. They were probably items that I added either at 2am when I was too tired to be rational, or during the 15 minutes before class when I dissociate and just troll the internet. If you’re looking for a unique, funny gift to give a friend or family member, consider this list a guide to potential gift options. The below items would also be great for a Yankee Swap, White Elephant, or Dirty Santa gift exchange. If you’re just here for a laugh at my expense, that’s quite alright as well. If you’re my mom and you’re reading this (hi mom! ), I encourage you to continue reading: great gift ideas ahead! The best reading season is inarguably fall. Summer is sometimes nice for reading outside, except that actually it’s super hot and sweaty and buggy and awful. People glorify “beach reads,” but books get all sandy and suncreen-y and warped just from being near the ocean, I guess. (Insert Danny from The Mindy Project shouting “I fear the ocean out of respect” here.) Reading in the winter is terrible because it’s constantly freezing, and if you’re wrapped in a blanket, your hands are exposed in order to hold the book. Unless you’re in possession of a Snuggie™, months of suffering ensue. And spring is mostly just Winter: The Sequel. But fall…fall is the best. It’s a mix of nice days—you can read outside and the trees are pretty!—and brisk days—you can read inside and be super comfy! Also, hot beverages make their triumphant return, and everyone knows that there is no better way to read than with a cup of coffee/tea/cocoa/cider. Come for the witches, stay for the tiny hand-blown glass animals. That’s not the slogan for the town of Salem, but it definitely is for my time there. I was initially interested in the grisly history of the witch trials, especially since it’s perfect for Halloween. I mean, the pivotal film Hocus Pocus is set there. But I must confess I spent much more of my time delicately combing through a tray of miniature polar bears and dogs and squids than I did contemplating the fickleness of humanity at the witch trials memorial. Perhaps the most important part of my Salem adventures, however, is the fact that I spent less than twenty dollars for the whole day, train fare included. Here are my tips for how you can spend a day in the insanely-crowded town without breaking the bank! Just go over to the little Charlie card ATM-like robot and buy a ticket. It’s a couple dollars cheaper, and those couple dollars can buy you a magical stone. A magical stone!!! More on that later. Earlier — as in, immediately before this — I mentioned a little something about a magical stone. It’s time to talk more about that. 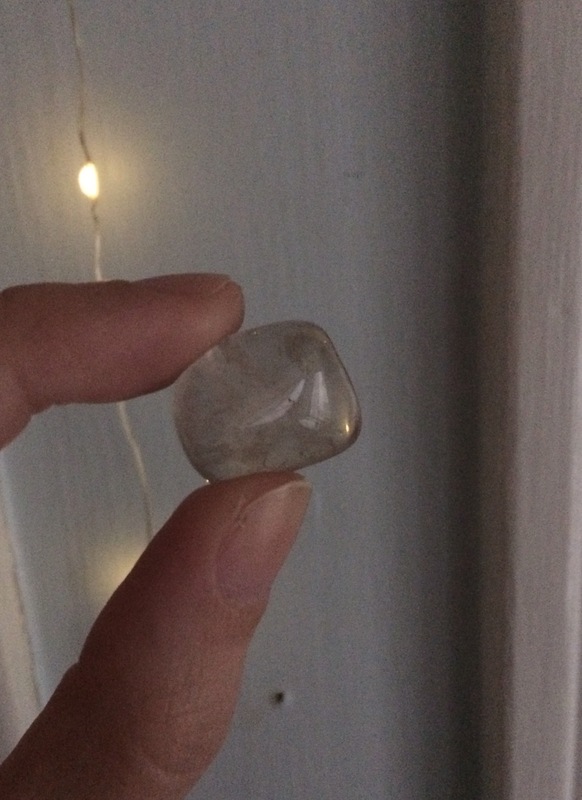 I spent the unbelievable price of ONE AMERICAN DOLLAR on a stone that promises to increase my success, elevate my mood, and grant wishes. And it looks good doing it! This is an amazing and useful souvenir, especially since I’ve already gone a few days and haven’t lost it! A lot of the stuff in the witchy stores in Salem is reasonably priced. So are postcards and little things like that. If you want a souvenir from your spooky journey you don’t have to break the bank! t. There’s even the Salem Heritage Trail, which is similar to Boston’s Freedom Trail but distinctly witchier. And some of the most fun I had in Salem was walking around the stores. This is not because I am Isla Fisher in the 2009 film adaptation of Sophie Kinsella’s bestselling novel Confessions of a Shopaholic, but rather because there are a ton of cool stores in Salem. Some of them are so cool there is a line to get in! My favorite one was The Coven’s Cottage, and I chose to buy my magical stone from there because I liked the vibe. There are also wand stores, knick knack stores and bookstores, and all of these make for a fun browse! For me, this meant forking over a couple of ones for a hot apple cider. (Review: watery, but delicious!) For some of my fellow travelers, this meant fried dough, a book on Wiccan spells, a bandana for a dog or fifteen minutes with a fortune-teller. 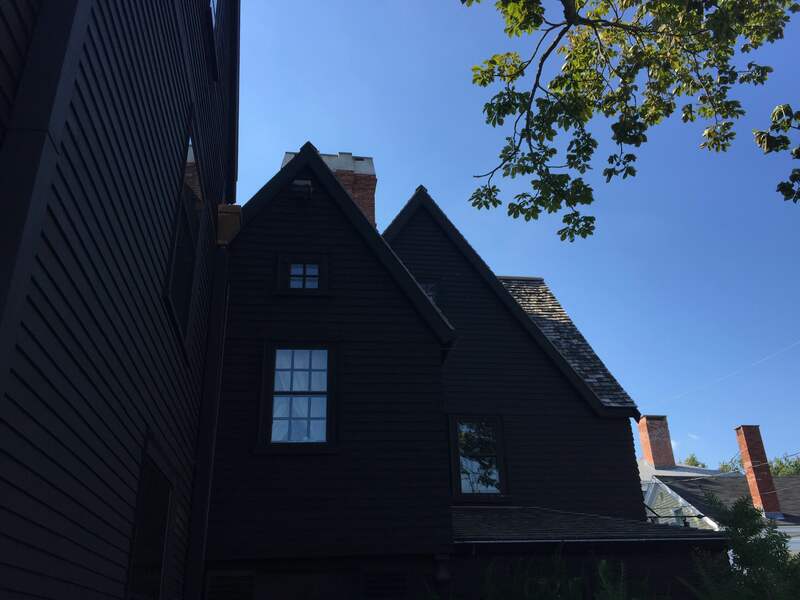 Some people enjoy feeling unsafe and frightened, and these people would not be able to visit Salem without entering the doors of one of Salem’s many haunted houses. There’s not much point to visiting if you don’t feel spooky or Halloween-y or, in short, Salem-y. So it’s worth it to shell out some cash for that One Thing. In short: Salem is great and very Halloween-feeling and it doesn’t have to be expensive! If you plan in advance and consider what will make your experience really worthwhile, you can have a solid day for $20 or less. Let’s face it. Horror movies have a bad reputation. Recently, the genre has consisted of either a remake, a sequel, or, just plainly, an unoriginal, uninspired horror flick. In that way, it’s easy to forget how impactful horror films really were to the industry. Horror filmmakers weren’t afraid to break barriers and cause controversy. Because of these achievements, they have inspired countless horror films to this day, but, at times, it’s hard to find those original ideas. So, this Halloween, celebrate the old and the new. This year, since Halloween is on a Tuesday, the “Halloweekend” is October 28-30. Each day represents a different horror subgenre and brings two films: the horror movies that have influenced many, and the newer horror comedies that prove that horror can still be original. The slasher film is probably what most people think of when a horror movie comes to mind. With so many out there, there are many patterns that far and few have been able to break. However, all of those – now redundant – patterns can be traced back to one film: The Texas Chain Saw Massacre. Before even classics like Halloween and Friday the 13th, Texas Chain Saw Massacre was the film that shocked and scared audiences everywhere – and still to this day. Not only does the killer himself terrify, but also the ambiance of the film. The direction of each element made a perfect horror film and still holds validity today. Without this classic, the genre would be entirely different – maybe even unrecognizable. Until then, not many took the risk of adding the immense amount of gore and intensity that Texas Chain Saw Massacre possesses. It definitely didn’t hold back on its general grotesque nature. Its mark is definitely seen in a numerous amount of films, including the next pick: Tucker and Dale vs. Evil. This movie, in a word, is absurd. There is no denying that this is a goofy, unpredictable, crazy film. Even the title is questionable. Nevertheless, the hilarity is undeniable. Each and every turn the movie takes is absolute insanity, but that’s what makes the film great. Tucker and Dale vs. Evil is a satire of the “cabin in the woods” slasher film but doesn’t rely on overused jokes that can be seen in any Scary Movie comedy. Though not the greatest in the world, it’s still a fun watch, especially after viewing a film so gory and menacing. Texas Chain Saw Massacre is available on Amazon Prime and Tucker and Dale vs. Evil is available on Hulu and Netflix. The next day centers around a creature that has been, perhaps, over-utilized over the past ten years: the vampire. Though the Twilight and True Blood series have made the monster into a love story, there was a time when people thought the creature was utterly horrifying – that time, of course, being in the 1920s. Nevertheless, Nosferatu is nothing short of a groundbreaking horror film in the silent era. Though it may not be everybody’s first choice for being on a horror movie list, the film still has its qualities that can get under a person’s skin. The film has inspired not only horror films but the film industry in general. Its ability to still be recognizable today, despite being made nearly 100 years ago, shows just how iconic the film really is. There are even elements of it in the other pick of the day: What We Do in the Shadows. Not only is it hilarious, but it is, arguably, one of the most underrated horror comedy films in recent history. The New Zealand film is a mockumentary on three vampires and, though it’s set in the modern world, these vampires are still stuck in the past. While still being able to have its fair share of scares, What We Do in the Shadows uses its smart wit and charm to its advantage, creating a fantastic balance of horror and comedy that not many are able to achieve. These two vampire features break the mold of the now repetitive vampire film and instead allow more originality in the genre, both with a classic and a dark comedy from 2014. Nosferatu and What We Do in the Shadows are both available on Amazon Prime. Ending the weekend is a pair of cult classics that have made their marks in cinema history. Featuring iconic movie monsters, they both changed the genre and the icon of their respective creatures for years to come. To start, Night of the Living Dead revolutionized the horror genre with its gory spectacle and grisly depictions of the zombie. Similar to what Texas Chain Saw Massacre did to slasher films, Night of Living Dead not only rejuvenated and recreated the zombie creature but also made its mark on horror film history by influencing many horror films known and loved today. Though an independent film, it was able to reach to wider audiences and allowed a breakthrough for horror that continued for years to come. Director George A. Romero’s reimagination of the zombie is what the modern iteration is based on, proving his contribution to the creature as a whole. The second movie also benefited from the film in that filmmakers were no longer afraid to show the far darker and grislier side of horror. An American Werewolf in London epitomizes the horror comedy in that it perfectly blends the two completely different genres, but it is definitely creepier than what a conventional movie in the genre would look like. It’s dark and, at times, even a little uncomfortable to watch with its captivating creature designs. Being one of the few horror films to have won an Academy Award, this film is credited as being one of the biggest achievements in makeup in film. Headed by Rick Baker, it was the first film to receive the Best Makeup and Hairstyling Oscar and was the makeup artist’s first of a record seven wins. The iconic transformation of the protagonist from man to werewolf is gruesome, yet utterly hypnotizing. It’s mind-boggling to think this was made 36 years ago with practical effects, making it, possibly, one of the best visual effects achievements of all time. The transformation scene alone makes it worth the watch, but the entire film deserves its spot because of its great impact on the horror comedy genre for years to come. Night of the Living Dead is available on Amazon Prime and An American Werewolf in London is available on Amazon Prime and Hulu. Though horror does have a stigma for being cheesy or rudimentary, there are still gems that prove that the genre can produce legitimate films for critics and for audiences. There is no denying that horror films are still a staple of the film industry and should be celebrated as such. Yes, there are many bad horror flicks to choose from and, ultimately, laugh at, but, this Halloween, celebrate the ones that were able to change how people thought of the genre. My boyfriend’s parents are visiting Boston and were kind enough to take my boyfriend and I on a day trip to Salem. I have lived in Boston for three years and have never been to Salem. It’s absolutely outrageous. Luckily, last Monday I was able to visit for the day and was finally able to attach history and geography. 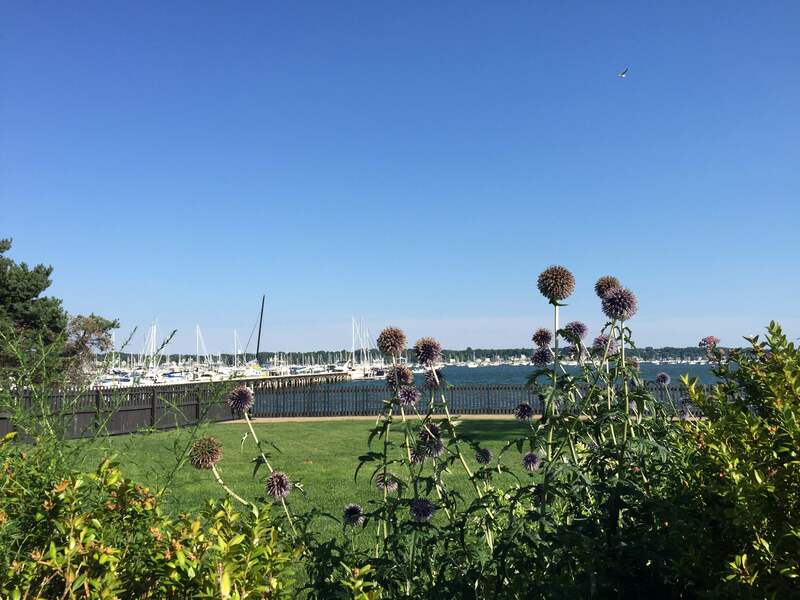 Salem is a beautiful city, it is right by the water and much like Boston, still maintains the historical charm while accommodating to the needs of modern life. A $15 roundtrip ride will get you to Salem in 31 minutes. Perfect for a day trip! When we arrived to Salem, like good tourists we followed the signs to the Peabody Essex Museum. What we did not know is that the museum is closed on Mondays (a good thing to know if you are traveling specifically to the museum.) 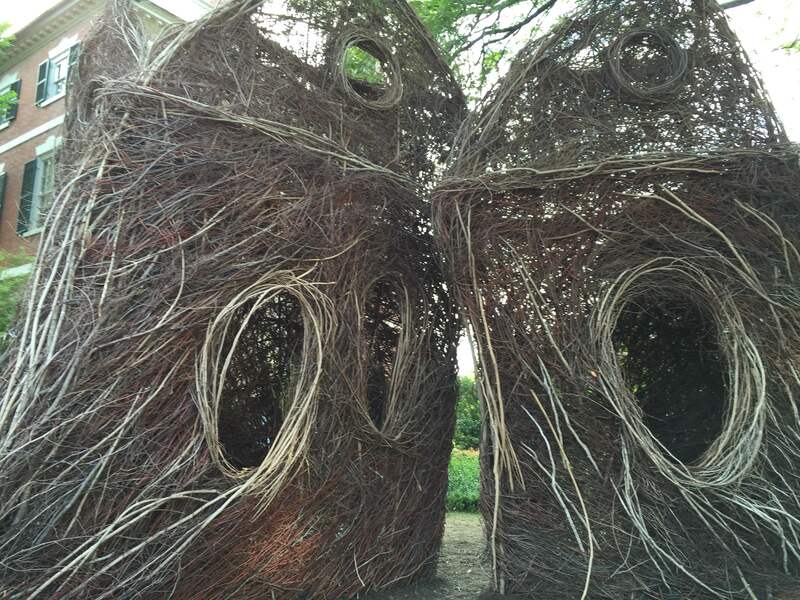 We weren’t too disappointed, however, since there is plenty to see and do in the city. We decided to walk to the House of Seven Gables which is a 15 minute walk from the museum. On our walk we spotted many cool stores. Unsurprisingly, most of the stores sell souvenirs, as well as anything witch-related you can imagine. My personal highlight was the Harry Potter wand store, called Wynott’s Wands. We also got to see the Naval Maritime Museum, as well as the U.S. Custom House which is a very pretty historical landmark. When we finally arrived to the House of Seven Gables, we took a tour. First, we went into Nathaniel Hawthorne’s birth house. It was moved from its original spot, but was still intact. It was a lovely way to see how people in the 17th century lived, the things they used and what was considered fancy at the time. I am not a personal fan of Hawthorne, but it was still extremely interesting to see the places where he use to write and keep his manuscripts. Then, we took a tour around the House of Seven Gables. This is the original house from where Hawthrone drew inspiration for his novel. The house has a beautiful view of the water and is still incredibly intact. The rooms inside the house are decorated lavishly, showing the wealth of the family. Apparently, Hawthorne’s cousin lived in that house and was the one who told him to write about it. During the tour I also learned that Hawthorne’s great-great-grandfather (John Hathorne) was a judge in the Salem Witch Trials. He was the judge who carried the trials on and never repented of accusing people to be witches. To eliminate the bad reputation the named carried, Hawthorne added the ‘w’ to his last name. The tour of the houses was very inspiring. They were both beautiful and entering them was like traveling through time. Once we had seen both houses, we went for a bite to eat. We decided to try Boston Hot Dogs. It was definitely a good choice, they had all sorts of crazy hot dogs and many options to choose from. They also had vegetarian and vegan options, a huge plus for me. After the good food, we went on our night tour. We took a Historical Salem Night Tour. The guide was himself a practicing witch and had grown up in Salem. He took us around to the Memorial and to some of the other landmarks where the witch trials had occurred. The guide was very good in debunking myths about the trials and gave an informed overview of what had occurred historically. 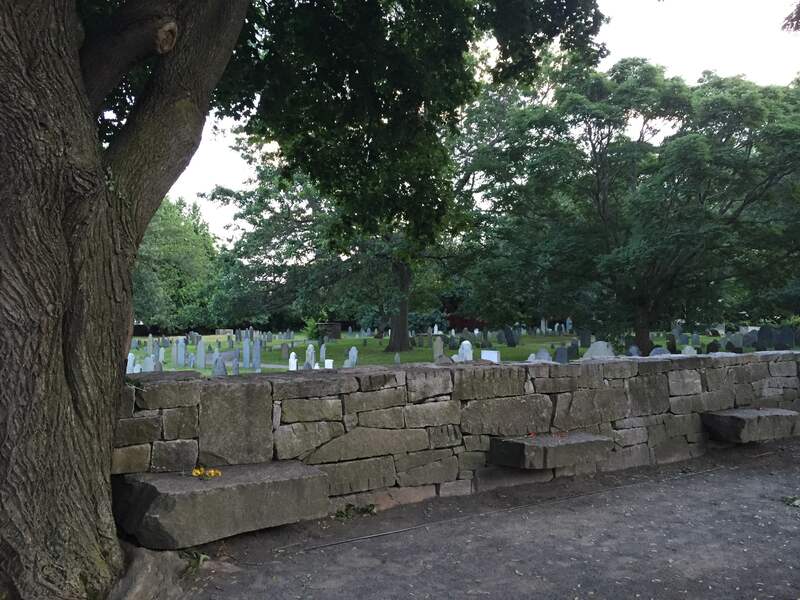 We did not see any ghosts or witches during the tour, but we did happen to walk around the second oldest cemetery in the nation. Having our good feed of Salem history, we were happy to get on the train back to Boston. The trip was very successful. I would recommend it to anyone who is interested in learning more about American history, while also engaging on a fun look at witchery stores. It is also great to go during summer, since the weather is nice and it is not nearly as crowded as it is during October. When I was a kid, fall was my absolute favorite. Of course I loved Christmas in the winter, my birthday in the spring and the never ending playfulness of summer, but something about fall air always energized my young mind. Some of my most heartwarming childhood memories are from brisk Halloweens where I would play in the leaves until I exhausted myself, only to get all dressed up like Snow White to solicit chocolate from my sweet elderly neighbors. When you’re a kid, Halloween is a time of endless possibilities. Costume choices were abundant, the word “diet” was something you didn’t even really know the meaning of and the scariest possibility of the night was that a neighbor might jump out at you from behind the bushes. Unfortunately, as we get older we become all too aware that many costume choices are uncomfortable or inappropriate; guilt may now come with eating that extra Kit Kat and the frightening monsters of our childhood have nothing in comparison to the horrific actions of actual human beings. With all that being said, there is still hope for Halloween to be the wonderful holiday it was meant to be. How can you recapture these warm and wacky feelings? You simply refuse to admit you are an adult, at least for a day. You may be an adult but that just means that your parents aren’t around to tell you that you’re eating too much sugar. Wear the costume you want. Do you and your best friend want to go as Dalmatians and make cute puppy jokes all night? Do it! Your 5-year-old self would laugh and laugh and think it was the most wonderful thing in the world. Decorate your house or apartment. Make your living situation just a little more spooky. You might seem corny or immature celebrating Halloween this way to some people but you can sleep better at night knowing that you’re having more fun than them. You’re probably also having more Reese’s cups than them and that helps too. I can practically see you rolling your eyes already and picturing me sitting in front of my laptop, sipping on orange, frothy goodness from Starbucks, wearing yoga pants and Uggs and cradling a small baby pumpkin. Even though that is not what I look like currently, I would not mind finding myself in that situation. I don’t know when fall favorites became so humorous. I can’t even dream of walking down Boylston Street with my Pumpkin Spice Latte without getting at least two or three snarky comments. People laugh when they see the pumpkin sitting on my windowsill and joke about how stereotypical I am. I even get sly remarks when I wear big flannels and combat boots. Yes, I love fall! What’s so bad about that? I think the Pumpkin Spice Latte is wonderful. It is warm, tasty and festive. It’s exactly what I need to pick me up after a long and chilly day of classes and activities. Big sweaters are just so comfortable and cute, and there’s no way around it! And yes, my riding boots do keep my feet warm and make me feel like I just stepped out of a J. Crew catalog. So don’t mind if I do. There’s also just something so wonderful to me about seeing pumpkins and other fall trademarks all around my suite and dorm room. These things remind me of my childhood when I would roll around in the leaves on Halloween and then take my jack-o’-lantern bucket and try to milk the elderly of my neighborhood for as many Kit Kats as my little stomach could handle. Fall is my hometown through the lens of a seven-year-old. Fall is the warm relief of a warm cup of coffee and hot chocolate after a brisk day. Fall is being surrounded by the color of orange even though it looks horrible with my complexion. So yes, I love fall and I love pumpkins. And I love the Pumpkin Spice Latte so much that if you were to cut me during the months of September through January, I would bleed orange, frothy goodness. Fall is our friend; let’s all try to embrace it a little bit more.